Gardeners have been growing spinach for centuries. Spinach (Spinacea oleracia) originated from a wild native in Nepal or southwestern Asia. Spinach was grown in 7th century China, and cultivation spread throughout the Middle East and Europe. Like many cool-season vegetables, spinach is a “spring ephemeral” that starts out as a low rosette of leaves. Spinach thrives with regular water and cool temperatures, but “bolts”, or sends up a flower stalk, as temperatures rise in summer. Wherever it’s grown, there’s a brief window as spring unfolds into summer where spinach flourishes, and growing spinach is effortless. In long-summer areas, lucky gardeners get a second shot at growing spinach in the fall. Spinach is a cool-season crop that can withstand a hard frost or two, but turns to green goo when exposed to sub-freezing temperatures for any length of time. When growing spinach in cold weather, choose savoy varieties like ‘Bloomsdale’ or ‘Regiment’. Spinach is also very sensitive to heat. 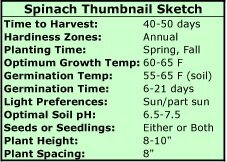 Seeds will not germinate if temperatures are over 75° (24°C), and spinach bolts quickly once temperatures begin to climb in summer. 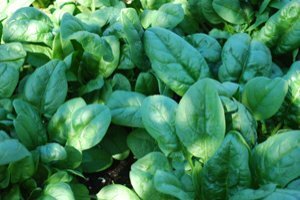 If you’re growing spinach in the summer, select bolt-resistant varieties (like ‘Tyee’ or ‘Space’), and plant them in the partial shade of taller vegetables. Punch the seeds down deeper into the soil (at least 1”--2.5 cm), mulch them, and give them plenty of water. Use floating row covers to extend the season into winter, or get a jump on growing spinach in the spring. Spinach grows well in any fast-draining garden loam. It thrives in soils with a lot of organic matter, as long as they’re not too acidic. Incorporate 3” (8 cm) of good garden compost or well-aged manure into the bed at planting time. For luxurious growth in spring and summer plantings, mix 2-3 lbs (2-2.3 kg) of alfalfa meal (per 100 square feet--9 square meters--of bed) into the soil at planting time. For fall and winter plantings, mix in 1 lb (1/2 kg) of fish meal, or some other animal-based, cool-season nitrogen source. Spinach thrives in a slightly more alkaline soil than most vegetables (pH 6.5-7.5). If your soil is acidic, add finely crushed eggshells, ground oyster shell, or wood ashes to compensate. 1-2 lbs (1/2-1 kg) per 100 square feet (9 square meters) is sufficient for most garden soils. For other ways to raise soil ph, see Changing Soil pH. When planting spinach, you can sow seeds directly, or transplant seedlings to prepared soil. Spinach has fine, fibrous roots, so try to avoid disturbing them too much when transplanting. When planting spinach in a single-dug or tilled bed (soil loosened 8-10” --20-25 cm--deep), plant spinach in rows 12” (30 cm) apart. Sow seeds ½” (1.3 cm) deep every 6” (15 cm) along the row, or sow more seeds and thin to this spacing. Cover with ½” (1.3 cm) of fine mulch. For baby spinach, sow in a 3-4” (7-10 cm) band on ¾” (2 cm) centers, 40-50 seeds per foot. Harvest in 3-5 weeks. 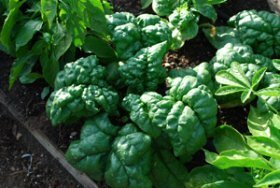 When growing spinach in a deep-dug or raised garden bed (soil loosened 20-24”--50-60 cm deep), plant spinach on 8” (20 cm) centers (seeds or seedlings 8” (20 cm) apart in every direction). 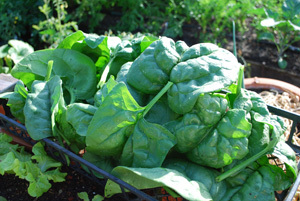 Growing spinach requires regular watering, especially in spring heat waves. Drip irrigation works fine, but most spring ephemerals do best when their leaves get wet. On a hot day, a splash of overhead water in the heat of the afternoon cools the leaves and the soil under the plants, and drops the overnight temperatures right into the 60-70° (15-21° C) groove most cool-season plants thrive in. If you build the fertilizer into the soil when planting spinach as described above, supplemental fertilizer isn’t necessary. If you add no organic fertilizers at planting time, a shot of fish emulsion, compost extract, or compost tea at the first spring heat wave will produce more luxurious growth. Spinach needs no special plant care beyond watering and harvesting. In many areas of the country, spinach is a relatively pest-free plant. Unfortunately, mine is not one of them. We have Spinach Leaf Miners (Pegomya hyoscyami). 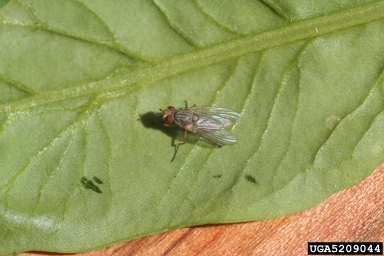 Leaf miners are tiny (1/4”--6.5 mm) flies that lay their eggs on the undersides of spinach, chard, and beet leaves. The larvae hatch and burrow into the leaf, carving out tunnels and pockets the size of a quarter. 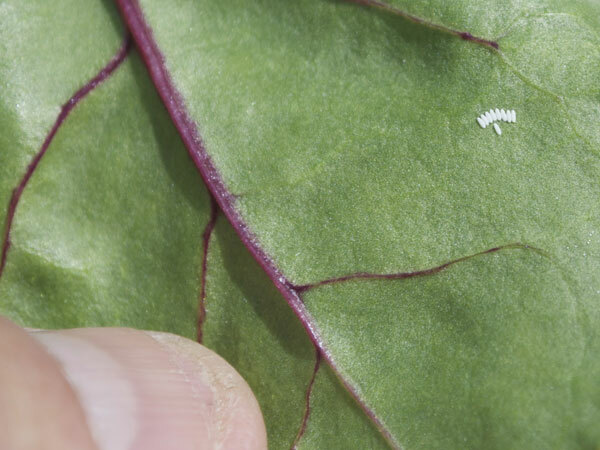 The leaf cuticles protect them from parasitoid wasps and most garden insect predators. Growing spinach where leaf miners are prevalent requires careful monitoring and quick action to prevent wider outbreaks later in the season. Mechanical controls work best with leaf miners. Floating row covers can be used to exclude adults from the leaves, but they won't keep out leaf miners that hatch inside the row covers (from last year's beets). At the first sign of tunneling in the leaves, check the undersides of leaves, and look for rows of 7-8 white, sliver-shaped eggs. Smear them over the bottom of the leaf with a finger, or spray with a garlic-soap spray. Pick off any leaves with extensive tunneling; you’ll see small grubs in the corner of the pocket. Put them on a piece of sheet metal or in a plastic bag in the sun for a couple hours, then compost. Spinosad, an organic actinobacterium, can also be applied to the leaves, but you have to spray the undersides of the leaves, and the pests have to hatch and ingest the bacterium to become infected. 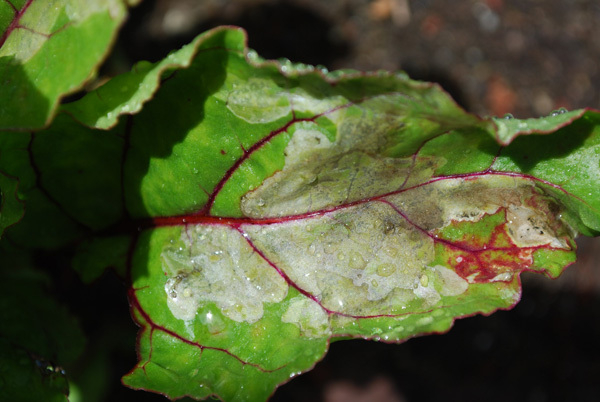 Downy Mildew can be a problem in adverse environmental conditions or crowded plantings. Where it is a problem, plant resistant varieties like ‘Indian Summer’ or ‘Tyee’. For more information, see Cornell’s Vegetable MD Online for an article on diseases of leafy vegetables, including spinach. 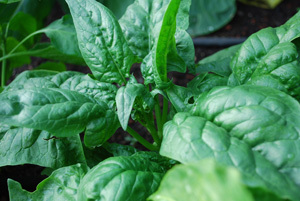 Cornell also has a list of disease-resistant spinach varieties . Spinach, lettuce, and brassicas (broccoli, cabbage, cauliflower, and kale) share similar soil needs, so spinach can be interplanted between larger brassicas. Set the brassicas out on the spacing they’ll occupy at maturity—usually 18-24” (46-61 cm)—then plant spinach between the plants (and between the rows, in deep-dug or raised beds). 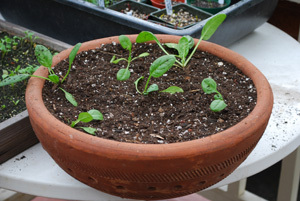 Spinach is a great plant for container gardening. It can be grown in salad trays as shallow as 3 ½” (9 cm), as long as it gets enough water, but it thrives in the deeper root zone of a pot or window box. 6-8” (15-20 cm) is all it needs. In the warmer environment of a pot, nutrient cycling is faster, so you can add vegetable-based nitrogen sources like alfalfa meal or soy meal, as well as animal-based amendments like worm castings, fish meal, feather meal, or composted manure. 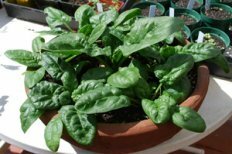 If you want truly spectacular container spinach plants, add a small amount (1/4-1/2 cup, depending on container volume) of bat guano to the potting soil. I like to layer amendments in around the middle of the pot, and claw them into the lower layer, then top the pot off with 3-4” (8-10 cm) of straight potting mix. That way, any stray pernicious bacteria are buried, and won’t get splashed up onto the leaves by rain or over-exuberant watering. If you ever reveal to friends that the delicious, succulent salad they're eating is due to half a cup of bat guano, you may want to also mention this protocol. The best part of growing spinach, is harvesting leaves moments before you need them. As in plucking a leaf, and placing it on a sandwich, or stuffing it directly into your mouth. Harvesting spinach is an early morning task, because the leaves are at their most succulent after the cool humidity of night. At first, you can harvest larger leaves by pinching or cutting the stems near the base of the plant, and leaving the smaller, interior leaves to size up. As soon as the plants start forming a flower stalk (bolting), cut the whole plant off at an angle an inch above the base, then pull and compost the roots. Leaves from a bolted spinach plant are still tasty, but they become smaller and thinner the longer the plant stays in the ground. Pinch the leaves off from the stems and rinse them briefly in a bowl of cold water. Spin to remove excess moisture, then place in a plastic bag or storage container with half a paper towel to absorb excess moisture. Spinach stored this way will last over a week in the vegetable crisper. This recipe for sautéed spinach is simple and delicious. Wash and trim the spinach, then chop finely. Melt butter over medium high heat in a saucepan or skillet with a lid. Add spinach and stir. Let cook for a minute, add salt to taste, and stir again. Turn heat to simmer and cover pan. Cook for 2 minutes, then remove lid. Using a nutmeg grinder, grind a dusting of fresh nutmeg over the dish. Stir and serve.